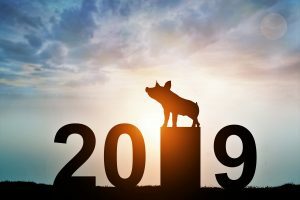 Are you ready for the Year of the Boar? The following Flying Star energy cures are transitional in 2019 and should be used in conjunction with the permanent (natal) Flying Star cures associated with your building. They are to be put in place on or before February 4, 2019 to help mitigate negative energy for the year. Please seek the advice of a professional Feng Shui consultant when placing these cures. Contact Diane. Place a metal wind chime or chiming metal pendulum clock in this sector to prevent obstacles, accidents, financial loss and misfortune. Place a salt water cure in this sector. Keep this area of your building/property quiet. Avoid loud noise, vibration, activity, bright lights, candles and Fire (red). Add Metal (bronze, iron, brass, copper, etc.) to exhaust excess Earth. Do not move earth, dig, plant trees or undertake construction, renovations, nailing into walls, demolishing in the Southwest of your home, property or business in 2019. Hang 6 metal coins tied together with red ribbon to help prevent illness and stress. Use heavy Metal objects (brass, copper, bronze) outdoors. Keep this area quiet with limited activity and avoid sleeping in this sector if possible. Place a metal calabash or round metal bowl to exhaust excess Earth. You may also place a metal wind chime and salt water cure in this sector. Avoid Fire. Place a piece of red paper, a bright light or another red (fire) object such as a red candle to prevent aggression, legal conflict and arguments. Add crystals or pottery (earth) to reduce wood energy. Avoid building, renovations, loud noise and vibration this year. Check documents carefully before signing in this sector. No Metal and no Water. Place 3 pieces of bamboo growing in clear (yin) water and add the colors blue and/or black to offset energy associated with scandals, robbery, hostility and deception. Avoid Fire and Earth in this sector. Keep sector quiet with limited activity. In 2019, it is essential not to disturb Northwest3 (Pig) sector (322.5 – 337.5 degrees) or Southeast3 (Snake) sectors (142.5 – 157.5 degrees). Do not move earth, plant trees, renovate, break walls or commence construction on any property/building in these sectors. Avoid sleeping with the crown of your head facing Northwest3 direction or facing this direction while seated at home/work. Avoid having the Southeast3 sector at your back while seated at work or rest.